Everyone is screaming about the traitorous actions of New Jersey Governor Chris Christie–rolling out the red carpet for the President and pretty much proclaiming him a God. 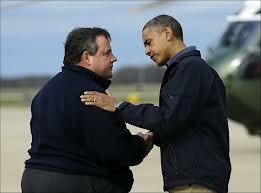 While everyone is afraid that Christie is handing vast amounts of votes to Obama…Nobody finds it too funny. Has everyone forgotten that politicians…all politicians, use disasters for reelections? It’s the most golden opportunity that they can hope for. Obama could have cared less about New Jersey, he wanted to set his presidential Commander-in-Chief podium down in the middle of the disaster (by the way, some poor sop has to drag that stand and a generator everywhere and set it up) and get Christie’s endorsement. Christie needed something from Obama, and for that–Obama got his endorsement. It’s that simple. Christie is up for election next year. Christie is a funny fish…like the republican Mayor Bloomberg, he supports many issues that conservatives abhor…global warming, cap-and-trade, Muslim judges,…and yet, people like Ann Coulter were giddy over the man. Conservatives loved his stance against the teachers unions, but the union leaders themselves had already decided that they didn’t want to honor those big pensions promised. After all, their benefits won’t be touched. Besides, those big pensions would take money away from the Democratic politicians…money sorely needed to keep them in power. 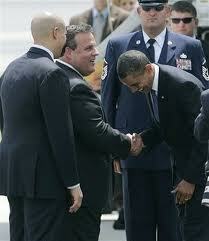 When you see Obama bowing to Chris Christie, certainly you know Christie was given him something pretty big. While many believe that Christie’s actions of kissing the ring of the Potus just to save lives…you have to admit that his sorrow is real. No doubt there was some of that in his head…but if you think Christie didn’t also do this for himself…think again. Christie is less a Rhino, then a future Donkey. 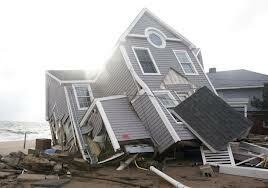 Did that photo-op help any of the people in New Jersey? Nope. Nobody Thinks the voters will just not bother to show up. Why in the world should they? They have much bigger concerns. Nobody in the Government is coming to their recue..and they are about to find out just how broken everything really is. On an ending note: Notice that it was the rich people’s houses that were totaled on the Jersey Shore, and was this also about Obama getting the taxpayers to rebuilt those houses? Was Christie lobbying a broke Federal Government for the rich? Nobody Knows. And if that’s true, will YOU hear about it?